Mattancheri is an artist's delight, it is home to some very beautiful frescoes. The walls of some of the palace chambers are adorned with paintings done in the traditional mural style of Kerala. What makes this temple so special to the art lover, apart from the rare idol, are the exquisite paintings on the walls of the sanctum. Eight large panels and about twenty smaller ones feature episodes from the Hindu myths and the Puranas. Ettumanoor temple is also a museum of rare and beautiful works of art and sculptures in wood and stone. The walls of the central shrine or sanctum are paneled with intricate and delicately carved wood. These panels form a kind of screen around the circular shrine. The goddess inspires fear and awe in the faithful. But as one walks into the temple and beholds the paintings around the shrines, the initial fear vanishes and a rare calm settles in. Familiar stories from the Puranas, in gentle and pleasant tones adorn the walls. This palace also contains one of the largest mural panels in Kerala. The famed Gajendra Moksha mural that measures fourteen feet by eleven feet is on the ground floor of the palace on the west, from where one can walk down to the palace pool. Murals decorate the inner walls of the room. These paintings depict gods and goddesses of the Hindu pantheon and are intended to create a congenial atmosphere for meditation. After schooling, he joined a painting school in Haripad and fine-tuned his skills at a painting school in Mavelikara. On successful completion of these courses, he joined a five year degree course ‘Kerala tradition in murals’, an innovative 'Gurukula' tradition course initiated by the Guruvayur Devaswom. 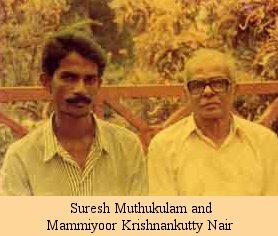 There he was fortunate to be tutored under late Mammiyoor Krishnankutty Nair, a stalwart with in-depth knowledge and creativity related to the art of Kerala mural creations. Mammiyoor Aasan's tutelage was a turning point in the career and life of Suresh. By then, he realized the way ahead for him should be to choose the less trodden world of murals. He spent more time on imbibing the essence and pulse of Kerala murals, which hinged on themes related to history, epics and events from puranas. 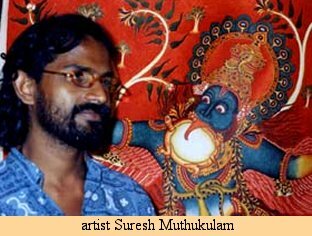 Later through his works, he created a path of his own and took Kerala murals creations to new levels and unknown themes, so far not experimented by the artists in Kerala mural tradition. 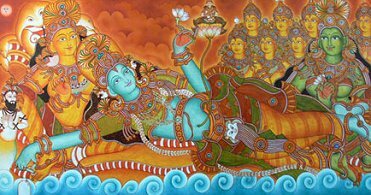 Naveen has a first-class National Diploma in Mural Painting, from the Institute of Mural Painting, Guruvayur Devaswom, Guruvayur. Vinod, hailing from God Own Country (Kerala ), began his illustrious career in the world of creative imagination as a visualizer in one of the most respected advertising agencies in India at Bangalore. A Diploma Holder in Painting from the University College of Fine Arts, in Davangree, Karnataka, he has enhanced his skill, with a diploma in Software Applications. K.U. 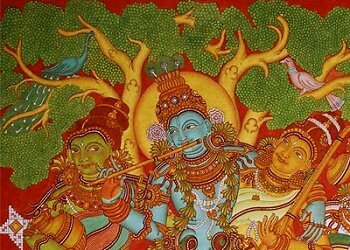 Krishnakumar, principal of the Institute of Mural Painting in Guruvayoor, talks about this unique art form. Sadanandan had done an intensive five year course in Mural painting in Kerala – South India, which was the strong foundation for his highly acclaimed accomplishments. His elaborate and exquisite works adorn many private collectors’ homes extending from New Delhi to New York. 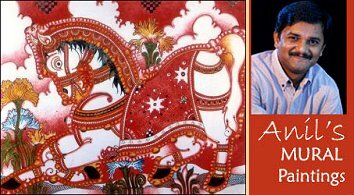 Anil V C is a dynamic, young artist whose painting style has been inspired by the traditional mural style of Kerala. His paintings drawing inspiration from the sacred texts or Dhyana Slokas are characterized by their line accuracy, the adherence to color symbolism, elaborate ornamentations and sensitive portrayal of emotions. He is an active part of the new genre artists involved in the revival of the traditional style mural art form, while also adapting the mural style to modern minds and spaces.